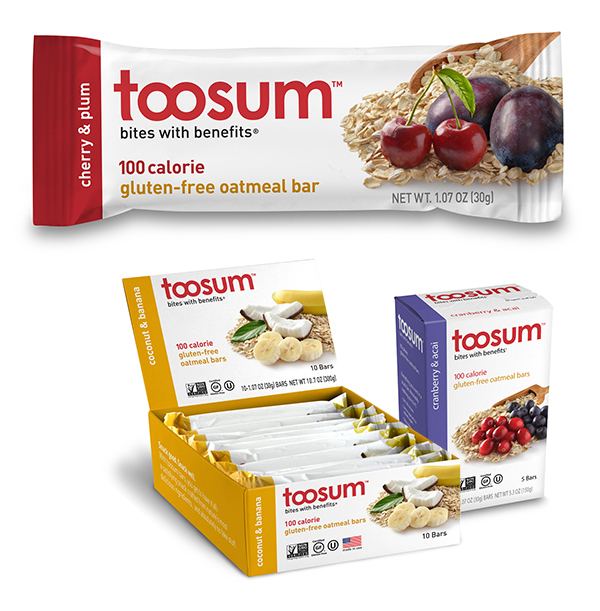 While preparing to expand both US and international channels, Toosum realized that its “Global Goodness” positioning was not optimal with key target consumers and its principal display panel was not ready to face stiff competition on retail shelves. Connector Branding created a new brand platform that emphasized toosum’s gluten-free and low calorie points of differences that are critical decision factors for active women looking for a healthy treat to tide them over to their next healthy meal. A new tagline, Bites with Benefits, and new copy communicate the new positioning in a memorable and playful, yet unique approach. Packaging graphics were simplified to optimize shelf impact while improving the overall quality image of toosum. Appetite appeal was significantly improved through higher quality photography with emphasis on healthy ingredients. The new packaging graphics system was then adapted to both 5 and 10 ct. cartons to maximize toosum’ s appeal at any retail or online setting.